Unique to Gairloch, ‘Sealife’ is the only boat cruise to combine looking beneath the waves whilst enjoying the breathtaking scenery and wildlife of Gairloch Bay. Situated in the beautiful North West Highlands of Scotland, golden sands, stunning forests, towering mountains all surround the hidden gem which is Gairloch. Crystal clear waters provide ‘Sealife’ with the perfect location for seeing up close our wonderful and spellbinding undersea marine world. Golden and Sea eagles, puffins, black throated divers plus many more species of birds are regularly spotted on cruises. For the eagle eyed, our evasive otter can be seen alongside our regular daily sightings of the common seal and grey seal. Luckily ‘Sealifes’ booking office is situated overlooking the Loch, were on occasions harbour porpoises and basking sharks can be seen, a real privilege. 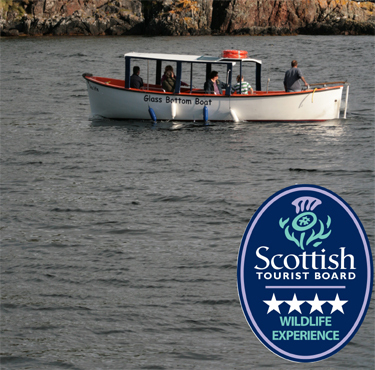 Come and join us on ‘Sealife’ and share the experience on the most unique cruise Gairloch can offer.